I don't think I have the words fully yet to describe the roller coaster we’ve been on for the last year nor did I intend to share any of this with you. But the more and more we get to know our Simone, the more I feel her story needs to be shared. And I chose to share this with all of you, my clients and prospective clients because this is part of my story. You should know me, my family and my why when you hire me to capture your stories. Becoming a mom and a heart mom is an experience that has forever changed me. Simone is a miracle. She is a warrior, my hero. Our journey so far is full of tears, unknowns, lots of love and real life. This is us. I still remember this moment and how fast my heart sank. At my 20 week ultrasound we found out our baby was missing chambers in her heart. Not even a couple days later she was diagnosed with complex congenital heart disease: tricuspid atresia, transposition of the great arteries, large VSD and coarctation of the aorta. The short version is that she has half a funky heart. This set in motion lots of tests, doctor appointments, the unknown. We transferred all our care to the University of Michigan C.S. Mott’s Children Hospital since they had the expertise to save her. We found out she would need three open-heart surgeries to live and while this will correct the blood flow to and from her heart and that she would never have a normal heart. We were so scared and had to idea what the future would hold. I spent the next 20 weeks learning everything we could about her condition and working through all the emotions you have when you find out you’re not going to have a healthy baby. Simone came into the world at 2:40am, weighing 7lbs, 9oz. She was perfect and our lives changed forever. I had to give birth in the OR because they needed to be prepared for any unknowns. The was a team ready to take her as soon as she was born. This moment in a blur so I am so thankful for the nurse who captured these photos and that I was able to hold her for a few minutes. She was immediately taken to the Cardiac ICU, to start getting life-saving medication to keep parts of her heart open until she could go in for surgery. This medicine made her swollen and very irritable, uncomfortable and she didn't enjoy being touched. This period of time was really difficult because I was postpartum and wasn't able to care for her in any way. I had held her maybe three times in her first couple of days and even that took two nurses to put her on my chest . I was not prepared for how difficult the pre-op stage was going to be. Her heart rate was so high and she was breathing super hard for days. We couldn't do anything for her but just trust her nurses and doctors and wait for her surgery. She was 4 days old when she went in for her first open heart surgery and this day was the for sure the hardest day of my life. Holding my new, tiny baby, knowing this was the last time I was going to hold her for a while, knowing they were coming to take her soon, knowing they were going to stop her heart and hope it will start again. It was too much and I cried and cried until they took her. I just kept telling myself she needed this surgery and we needed to be strong for her. The time she was in surgery felt like a lifetime. I think it was almost 10 hours until we got to see her. That day is a blur. We sat in a dark, quiet waiting room. Our hearts raced every time we heard the door open and our breath got a little easier with each update until the nurse came in and said she was back in recovery. While we were in the waiting room this song played: "Rise up" by Andre Day and we know that it played in that moment for a reason. She came back from surgery with her chest still open (these photos may be hard to look at for some). They tried closing her chest the next day only to have her stats drop too much and they needed to open her back up. Her chest remained open for another five days to allow swelling to go down. During this time she was still intubated and sedated. There was nothing we could do to care for her and we couldn't hold her. I then realized that this was the hardest part. My arms ached to hold her, to hear her cry, to see her eyes. I had a baby but was not yet able to be a mom. I sat by her beside, cried and held her little hand for hours. I was not mentally prepared for this time in the hospital, I never thought about what the recovery would look like for her, for us. On November 4th she was taken off her breathing ventilator, we were able to hold her for the first time in almost two weeks. Later that evening part of her lung collapsed and we spent the whole night watching the doctors and nurses do everything they could to get her stable without putting her breathing tube back in. It was a very scary night watching her the numbers on her monitor drop and the urgency in which everyone was working. She ended up in that scuba masking looking thing that was helping push air into her lungs. She fought through the next day and was able to come off the mask. The time in the hospital crawls but also goes at super speed. If you've ever lived in the hospital, especially the ICU, your day is spent just waiting and being patient but also having doctors and nurses in and out all day long. We spent lots of time just sitting by her bed but with so much going on the days just went by so fast. Right before Simone turned one month old we were able to leave the ICU to go to the general care floor. We were able to start caring for her for the first time. We got to start the journey of getting to know this extraordinary girl. We were finally able to take Simone home on Thanksgiving 2017! When they told us she was ready I couldn't believe it! We spent 35 days with nurses and monitors. The days were so long I never thought we were going to get to leave. We left with a plan for Simone to have her second heart surgery at the beginning of April. We were home a month (we did it!) when Simone turned 2 months old! She was growing stronger every day. We are definitely enjoyed all the snuggles. 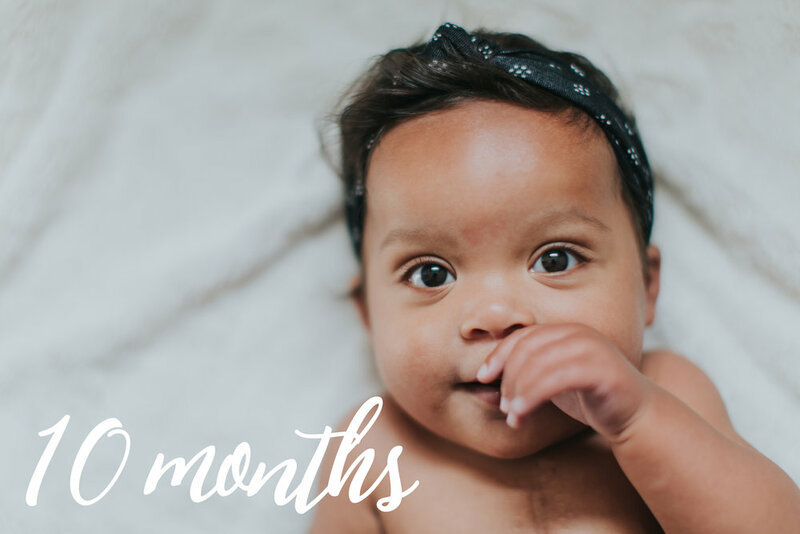 However, at the end of December, Simone was admitted back to Mott for heart failure and had to remain in the hospital for 10 weeks while we waited for her second heart surgery that had to be moved up. 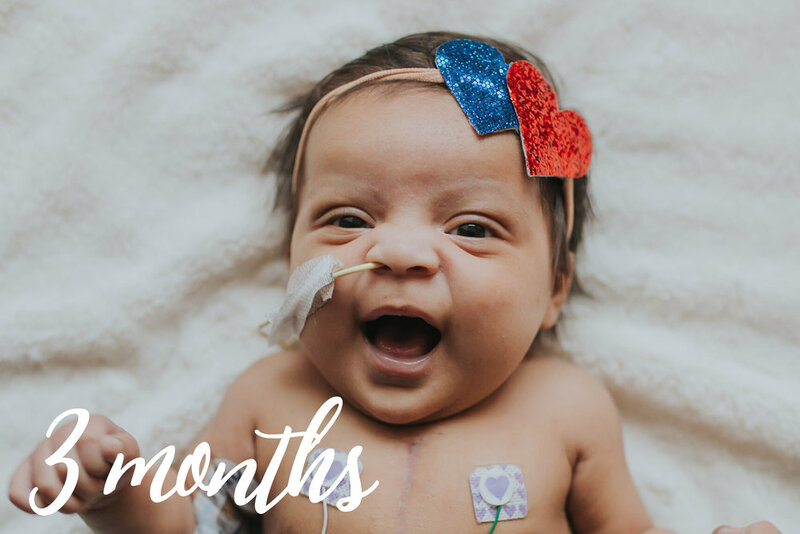 Simone had her second open heart surgery at the beginning of March and boy is she a superhero. She is the happiest, sweetest, strongest warrior. She was in the hospital for SO LONG and I couldn't be more thankful to finally have my girl home. We left behind lifelong friends including nurses, doctors, PT/OT and other patient families at Mott's which not surprisingly also feels like home. This isn't the end of Simone's story as we will have her third surgery looming in the distance but for now, we will be loving on this little lady.